Summary: “The Carls just appeared. Coming home from work at three a.m., twenty-three-year-old April May stumbles across a giant sculpture. Delighted by its appearance and craftsmanship–like a ten-foot-tall Transformer wearing a suit of samurai armor–April and her friend Andy make a video with it, which Andy uploads to YouTube. The next day April wakes up to a viral video and a new life. News quickly spreads that there are Carls in dozens of cities around the world–everywhere from Beijing to Buenos Aires–and April, as their first documentarian, finds herself at the center of an intense international media spotlight. Now April has to deal with the pressure on her relationships, her identity, and her safety that this new position brings, all while being on the front lines of the quest to find out not just what the Carls are, but what they want from us” (Goodreads). 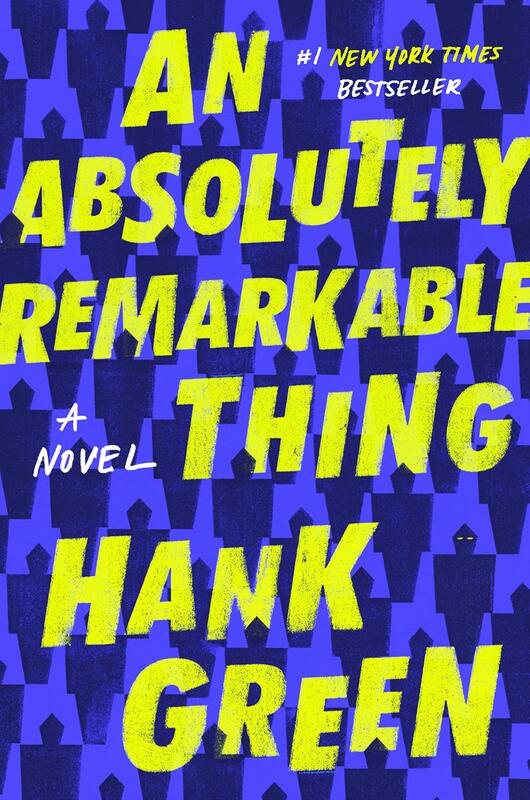 Part of me would like to start this review off comparing Hank Green, the man I never expected to write a book, to John Green, the man everyone expects to spend all of his days writing literature, but that would be a disrespect to both of them since they never chose to be brothers. After watching many Crash Course videos during late-night cramming sessions in which I couldn’t remember how RNA and DNA differed and whatnot right before an exam on that exact topic, I can conjure up Hank Green’s voice in my head. Unfortunately or fortunately (depending on how you see it), I read the entirety of An Absolutely Remarkable Thing in Hank Green’s voice as a result. I will say that I should not have been nearly as surprised as I was to find this book to be incredibly scientific. Those parts could have been boring, especially for me, a self-proclaimed Not a Science Person, yet Green put the same enthusiasm in them that kept me watching his videos despite the content going in one ear and out the other. I have seen many a review criticizing April May for being one of those narrators you want to hit in the head a little. And yes, I did want to hit her in the head—more than once—but there was something so absolutely (ha) raw and honest about her that made me fall just a little in love with her. I’ve been known to gravitate toward people in real life that reject affection. I have been a person to reject affection myself. While her inability to say “I love you,” to be genuine to her friends, to keep a relationship going under the pressures of fame, would have irritated me if it were one of my own friends, I somehow understood it. Perhaps it was the realness, the genuineness of it all, but I couldn’t bring myself to hate her, especially when I saw myself so deeply in her. When things get rough, my natural instinct is to back away. While it usually involves backing away from people who do the same exact thing to me, I cannot completely blame them for the faults in our friendship. It has been said, I believe, that we attract people like us (and that is an intensely scary thought for someone who doesn’t attract the Best People). But anyway, I digress, April May was not a likable character in the normal sense, but a likable character in the sense that I felt like I knew her. In another realm of literary hypocrisy, if April May were male, she would be every reviewer’s favorite character. Broodiness and detached, broken personalities are staples to the average fangirl, yet when the broodiness and detached, broken personality is in a woman, she’s rude, unlikable, harsh. Let’s take a step back and reexamine how we read male and female characters. Anyway, I think my main issues came with the plot, and it’s more of a “it’s not you, it’s me” situation. I do not like the concept of aliens. (“Why did you read it then?” you ask. “I don’t read synopses well, okay?”) This resulted in me being, to some degree, detached from the plot. While I could connect to the characters just fine, the plot was something I had trouble with. This book really isn’t about aliens/robots/sci-fi things. I mean, it is, but the heart of it, the most important part of the novel, is regarding the dangers of social media. The actual climax has nothing to do with the science-y aspects, but what happens when people take social media too far. I think I am an outlier in the sense that yes, I do have a blog and an Instagram and a Twitter, but my life is neither of the three. I read books, I write books, I play music, I go to school. If I could spend all day on one of the three platforms, I wouldn’t because I find it incredibly boring to be a transient figure in other people’s lives. The only reason I’m on the three is because I like talking to people about books and I like writing and I like photography. Sometimes I catch myself thinking “This would be a fantastic caption!” when something funny happens to me, but I shut it off immediately. We shouldn’t need validation through people we will never meet. And An Absolutely Remarkable Thing is a reminder of the importance to have a healthy attachment to social media, but also as to how social media can be a great tool when used properly. If we have the entire Internet at our disposal, we would be foolish to not use it. Studies have proven that the chemical released when we take drugs is similar to that released when our phone lights up with a notification. I will admit that while social media is not my lifeline, I do become a victim to the self-validating need to have a certain amount of Likes. But I will also admit that that relationship to my social media is entirely wrong to have. And I am grateful that Hank Green, a social media phenomenon, household name, is willing to admit that too. I recommend this book if you’re looking for something wholly unique.